When I did my menu plans for last week I only made it as far as Wednesday, leaving Thursday as a "throw something together" day. So when Thursday rolled around, I started to panic. I don't like not having a plan! Jon and I were texting back and forth for a few hours trying to figure out what to make. We both didn't have any strong cravings, and didn't feel like making anything too time consuming or that would produce a lot of dirty pots and pans. For inspiration, I went through my starred recipes in Google Reader and came across this recipe for Bacon Ranch Pasta with Spinach and Tomatoes on the blog Simple Gourmet Cooking. And then I found out that this is actually an original creation by my friend, the author of the blog A Taste of Home Cooking and it has made its way around the food blog world. I texted the title of the recipe to Jon, and his response was "Bleeeeccchh." See, he pictured pouring a bottle of ranch dressing over the pasta. I'm a little disappointed that he could even think that I'd do that! I explained the recipe to him and he agreed to give it a shot. While I was cooking my parents called so I invited them to come over - I always make more than enough food. But when my mom heard the name of the recipe she wasn't sure. So I explained it to her and she said she'd give it a try too. And my dad, well he'll eat anything I make! It was definitely worth trying! What a great creation my friend came up with! The sauce was delicious, and did have a similarity to ranch dressing. We all really liked it, and everyone had seconds. Except Jon...he had thirds! Cook bacon. Allow the bacon to cool, then crumble. In a small bowl, combine parsley, pepper, salt, garlic powder, onion powder and thyme. Heat 2 tablespoons olive oil in skillet large enough to hold the pasta over medium-high heat. Add onion and garlic and saute for 1-2 minutes. Add tomatoes, saute 1 minute. Add cream and bring to a boil. Lower the heat to a simmer and add seasoning mixture from step 2 and some cheese - about 1/2 c. Stir. 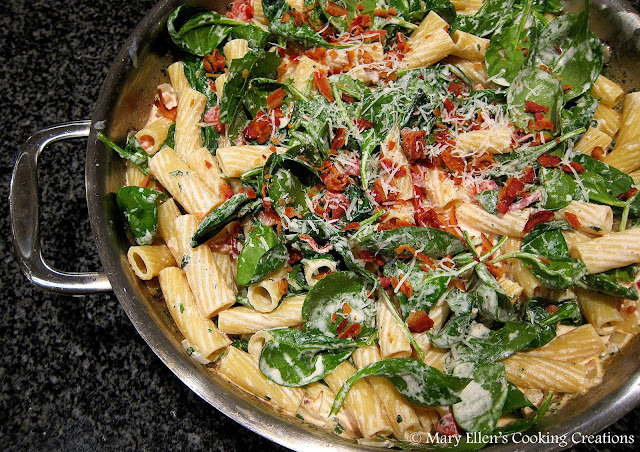 Add the pasta and spinach. Toss until the spinach wilts. Add some of the bacon, toss to combine. Top with additional bacon and cheese. I'm glad you liked it! We were also a bit worried about it-the name definitely does not do it justice!